We have a fine young man serving in our ward as a missionary. This young man is from a large family of sisters in Utah. He learned growing up to be appreciative of crafts and sewing. Since I am always working on something when he comes to our home, he has been so kind as to be supportive of my work. In my Halloween Block Exchange quilt that is posted on this blog, he saw a block that he really loved and asked if he could make one like it to send to his mom. "Of course. I would be happy to show you how," was my response. That block happened to be a block my beautiful daughter exchanged with me, so I knew I had access to the pattern. I asked her if she could, if she would be willing to draw it out or at least loan me the pattern. She took one of her busy evenings after work to draw the pattern out onto Steam-a-Seam Lite and ironed it onto the same fabric she used for my block which would allow this young man to have a block the same as what he saw in the quilt. He came over yesterday, and I showed him how to iron it onto the backing he chose. Today I sewed the edges down and made it into a pillow. He will mail it off to his mom on Monday. Hopefully she will receive it as a surprise Halloween "present" on Wednesday. How excited she will be when she opens this present and finds a gift from her missionary son. I know I would be. You can find this pattern at http://westmichquilter.blogspot.com/2009/08/halloween-tutorial.html. I was in Boise for my mother's 90th birthday party a couple of weekends ago. Lo and behold, there was a quilt show going on. Well I could not miss that. I gathered one sister, Mom, two nieces and my sister's friend up and we went to see what there was there. I loved the show. They had great vendors with better-than-California pricing. Best of all, they had beautiful quilts. One of the prettiest was my sister's friend's quilt. It was more than pretty, it was fantastic. It easily could have taken best of show. It did take third place. I would have loved to see the judge's notes to see why it did not rate second or even first place. As always I take lots of pictures at the guild shows. Here are the samplings I took. Good job, quilters. This is the Best in Show quilt. It is beautiful, as are the two ladies in front of it. They are my nieces, Melanie and Tabatha. A Baltimore Album quilt usually is hard to beat. This quilt and several of the ones following are quilts by the featured artist, Jackie Fuller. She had a huge area filled with her quilts. I was amazed at how many she had, let alone the quality of them all. I am a great fan of 1930s reproduction fabrics. This is simply beautiful. I should have taken a close up picture to help highlight the fabrics and workmanship. This is another of Jackie Fuller's quilts. I was totally amazed at the patience it must have taken to complete this quilt. It is not a big quilt. Each of the blocks are made of very, very small strips sewn together. I appreciate the work that goes into a quilt like this, but I doubt I would ever take it on. Maybe a mug rug some day, but not a whole quilt. Black, white and red quilts always get my attention, as do quilts with hearts on them. Both in the same quilt. Like it. I love "home" quilts. This is just a very warm fall quilt. Love it. Reminded me of California State Poppies. Colors on this quilt were beautiful. I have a son that is an engineer. I have been looking for a pattern that he might like. I think this is it. This is not a large quilt. I really like it for its non-conformity. The squares are wonky, as are the sides of the quilt. It was intriguing. This quilt was remarkable (I mentioned it in my lead-in.) The amount of work that went into this quilt is astounding. The quilter stated she wanted all the blues to match, which sometimes they did not. She fixed it by fabric painting them so they did. The next picture is a close-up of this quilt. I am a Border Collie owner and fan. It might be hard to make out, but there is a picture of, I am assuming, the quilter's Border Collie. Love the quilt, but love the dog more. This is another of those quilts that have very tiny rows of fabric. I would say they measure 1/4 of an inch. Unbelievable. I love the "motion" of the water, too. Very nice. I just really liked this quilt. I love Flying Geese, and I especially like them in the round like this quilt has. Good job. Embroidery is my passion. I love this quilt for its different sized blocks and mostly for its embroidery. Close up of some of the embroidery is below. Sunbonnet Sue is also a favorite of mine. Maybe someday I will actually make one. I started one back in the 1970s but never finished and wound up giving it away. Darn. Now I have time to have finished it. I always include a Halloween quilt. I have stated often it is my favorite. There was only this one that I saw. I do love this particular pattern and how it mirror effects the pumpkins. Very nice. Loved the show and was very thankful to have the time to go see it. Simple and easy to do. Just a little ribbon and some flowers and leaves from fall silk flowers. I did not glue anything down; I just pinned the flowers and ribbon to keep them from moving. The leaves are just stuck in and around. I did stuff the hat with crepe paper to give it substance. The second hat's flower is black and probably doesn't show up as well as the top hat, but it is really cool looking. As long as I am posting, I will post pictures of some of my other Halloween decorations I have up and around our house. ﻿The above quilt is one I made when I had my shop. Moda had put out this great line. We were carrying the whole line along with charm packs and layer cakes. To help highlight the line, I put this together out of one of the packages of charm packs. I loved it then and even more now, as it brings back wonderful memories of my quilt shop. How I miss it and all the people that shopped there. At the quilt shop, Cindy Brock and I hosted an evening class on how to make fabric pumpkins. This is the one I made. I love the fabric I chose to use. It is Halloween but not a traditional Halloween. This quilt hanging over our loveseat is a quilt top I purchased on e-Bay for less than $30. I has a lot of traditional Halloween fabrics. 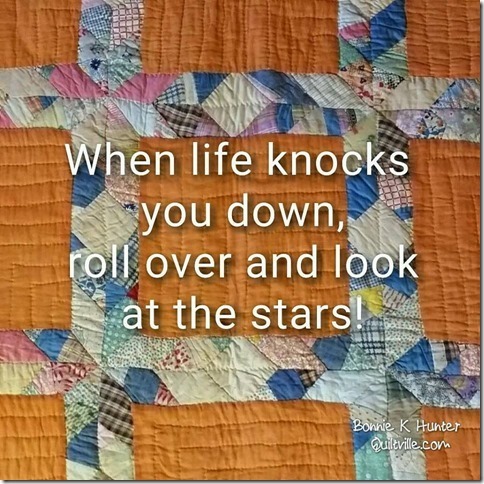 I put the border on it and quilted it. I should have taken a picture of the back. The fabric is so cute that I often turn the quilt over and show that side instead. This little quilt is a wall decoration Elisa made for me two Halloweens ago. She knows how much I love Halloween and whipped it up. It is one of my favorites. I keep it up all year around. During non-Halloween times it hangs in my quilting studio. I love it. This quilt was made several years ago for my sister. I loved it so much that I have never mailed it to her. Plus I don't know if she would take offense to it. It says "Things just haven't been the same since the house fell on my sister." Tee hee. 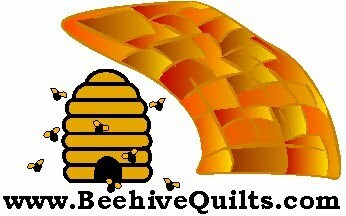 I belong to Sacramento's River City Quilt Guild. A few years ago I participated in a challenge quilt project. This is what I came up with. Spider webs seem to be a theme for me. I HATE spiders, except to decorate at Halloween time. This is a huge plate glass window that is in my dining area. It overlooks a wooded area behind our house where a lot of critters, both large and small, live. It seemed an appropriate place to hang it. ﻿When my kids were little, I made these pumpkins. My kids are now in their late 30s and early 40s, so the pumpkins are holding up quite well. Especially considering the boys thought they were inside balls they could throw around. I guess because they only come out a few weeks every year, the wear and tear on them doesn't show too much. The only part that is starting to fray are the stems. I made them out of green felt. They still make for a cute fall display. I have more stuff outside but I figured this was enough to show you how much I love Halloween. Have a great and spooky holiday.